I don't know if Alexandria Ocasio-Cortez (AOC) is a dangerous person but her ideas definitely are. They're dangerous because they are presented as achievable and beneficial when the reality is they have no chance of success and guarantee incredible economic harm. What a name, right? It is obviously meant to elicit thoughts of FDR's "New Deal" and to capitalize on all the things we (incorrectly) learned about that policy framework during high school. But let's ignore the name for a moment. Let's also ignore that the original "New Deal" was launched during a down economy, and that FDR's New Deal policies extended the Great Depression by years; we'd hate facts to get in the way of a grand vision. In her plan she calls for a complete transition to renewable energy (heavy emphasis on wind and solar) within 10yrs from the start of the plan, an upgrade of our entire electric grid to a "smart" grid along with a complete retrofit of every residential and commercial building in America to have "state-of-the-art energy efficiency, comfort and safety." There's also talk in the plan about a jobs guarantee, Medicare-for-All and other 'justice' programs. How much is this grand vision going to cost? Since the plan is so short on details it's difficult but Power the Future took a stab at it and based on PJ Media's analysis, their conservative cost estimate is nearly $50 TRILLION over the first 10 years. For perspective, the US Gov currently spends $4T/yr, so this would represent a massive increase in government spending. Missing from that estimate, among other things, is the opportunity cost of taking $5T (nearly 1/3 of the private sector GDP) out of the private sector each year and placing it in the hands of government. Ignore for a moment that the US Gov already wastes billions of dollars each year, but what goods, services and innovations will not be made or discovered because the money that would have gone towards those endeavors was instead spent on things politicians wanted, things that would benefit them, their re-election campaigns and their special interest donors? Such a cost cannot be quantified and its impact on our current and future standard of living cannot be measured. [I]n the same ways that we paid for the 2008 bank bailout and extended quantitative easing programs, the same ways we paid for World War II and many other wars. The Federal Reserve can extend credit to power these projects and investments, new public banks can be created (as in WWII) to extend credit and a combination of various taxation tools (including taxes on carbon and other emissions and progressive wealth taxes) can be employed. Great. Her answer is to just print and borrow more money, as if further destroying our currency and being $22T in debt already isn't enough. She also mentions increasing taxes, which I'll get to later. Let's assume for a moment that it can be paid for. Is it even achievable? Renewable energy production represents less than 20% of all energy production with Wind and Solar representing less than 8%. If wind and solar are to be the primary producers, that would require a near 8-fold increase in solar and wind production, assuming nuclear stays at its current 20% and the remaining renewable sources don't change. New locations would have to be scouted and environmental impact studies would have to be done (especially for wind given its impact on birds). Then there are the lawsuits from residents and States with NIMBY attitudes. The offshore wind farm that would have been Cape Wind was fought over for years and ultimately died. That makes hitting the 10yr time window incredibly unlikely. Upgrading the numerous power grids and upgrade each and every building in America? You'd be lucky to get that done in 25 years. I could spend days ripping the rest of her proposals apart (federal jobs guarantee, medicare-for-all) but I will save that for another day. We may all agree her goals are laudable but they lack a connection to reality. The cost is enormous and it doesn't look like the benefit even comes close to matching. There's an element where yeah, people are going to have to start paying their fair share. It's funny how no one ever says how much in income taxes you have to pay to have paid your "fair share." Below is a table showing the percentage of income earned compared to the percentage of taxes paid. Is any of that unfair? If so, and you believe the taxes paid should be higher than they currently are, how much of what other people earn do you think you have a right to take? Once you get to the tippy tops on your 10 millionth dollar sometimes you see tax rates as high as 60 or 70%. Yes, other countries have confiscatory tax rates. That doesn't make it necessary, proper or right that we also do that. Yes, the US has had top marginal tax rates as high as 90% in the past but with all the tax breaks and other tax rules in effect at the time effectively no one paid that rate. Taxation is theft to begin with and to argue that you have a right to take 70% of each additional dollar someone earns is a disgusting example of dehumanizing your fellow American into something akin to a cow to be milked. [A]s you climb up this [income] ladder you should be contributing more. Why? Why should someone who earns more be punished by having an ever-increasing amount of their earnings taken from them? "Because they can afford it" or variations thereof is not a legitimate answer, by the way. Let's assume for a moment the top rate was changed to 70% on incomes over $10M. Assuming no behavioral changes (and there's no way behaviors don't respond to such punitive rates) the Washington Post estimates $700B in revenue over ten years. The Tax Foundation's analysis includes considerations for behavioral changes and concludes in a best case scenario the policy would raise $291B over the first 10 years. Neither amount is anywhere near enough to pay for anything AOC wants to do. It appears she wants you to think the entire US economy can be changed in 10 years and Congress would only need to raise taxes on the the "tippy top" income earners. Newsflash: she's lying to you and so many are buying it hook, line, and sinker. 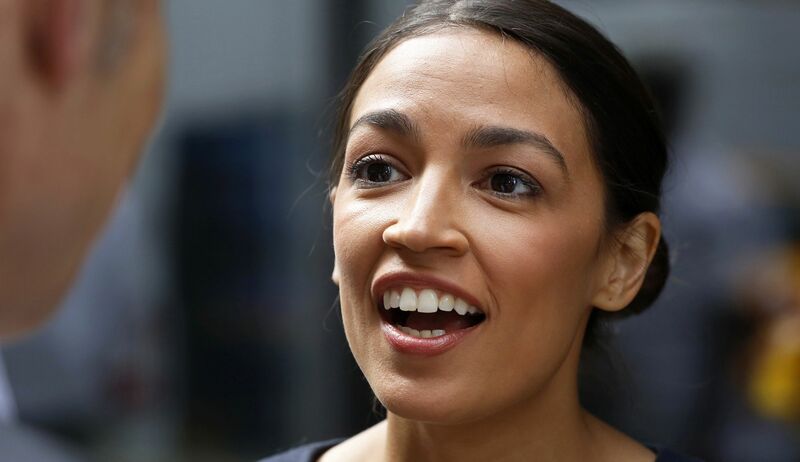 In an age of #MeToo and such I find her meteoric rise to Congressional stardom incredibly ironic given that much of it is likely attributed to her being a young, attractive female. Like it or not for whatever reason(s) the opinions and views of attractive people are given more consideration than others. Ocasio-Cortez has gotten more visibility and acceptance for socialist programs and ideas in the last 90 days than Bernie Sanders got in 20 years. The "democratic" in democratic-socialism is just window dressing attempting to hide the true intentions. Socialism is government elites controlling the economy for their benefit while they claim it's for yours. Countries that have embraced capitalism and economic freedom (even in small amounts) have seen the living standards and prosperity of all of its citizens rise. Countries like Switzerland, Netherlands and Sweden are routinely referenced as working examples of "democratic-socialism" and yet have more economic freedom than the United States. Her ideas are incredibly dangerous; they must be refuted at every possible opportunity. If we continue down this path we will end up like Venezuela.